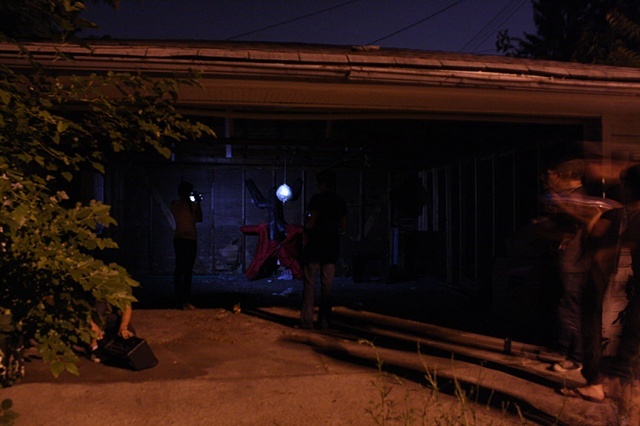 collaboration with FINISHING SCHOOL at DFLUX Research Residency in Detroit. Intergalactic HipHop Disco Jam is a short film chronicling a site-specific intervention initiated on the evening of June 21, 2010 in Detroit, MI. The motivation of the film summarizes our conflicted presuppositions of the city coming in as “visitors” to the environment in contrast to the reality of our experiences during our residency at DFLUX. The film plays between an intense oneiric extraterrestrial invasion narrative and cinema verité documenting an in situ heterotopic experiment. 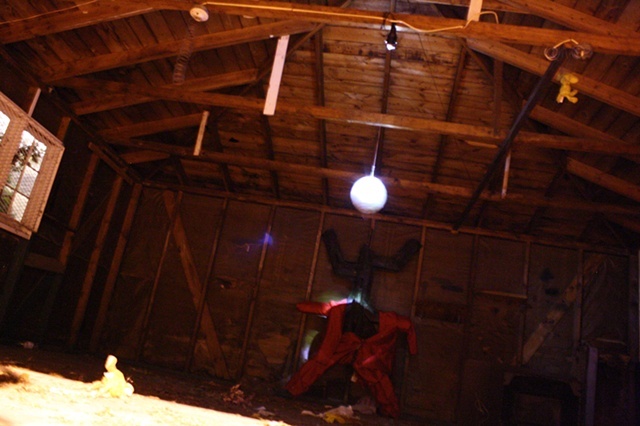 Intergalactic HipHop Disco Jam is deployed in an abandoned garage with access from a public street. The site is outfitted with solar panels to power lights, a revolving disco ball made from foraged materials, and broadcasted audio by a local UFOlogist/hiphop musician Shadow Klan that is transmitted from the DFLUX residence. On the first night of the intervention, the sound artist Wayne Grim accompanied the broadcasted audio with a live performance. The intervention is intended to draw and house ongoing elastic nocturnal activities.